If there’s been one particular sign of how technology has changed the way businesses of all sizes work, it’s the evolution of the telephone. In a world where landlines have given way to mobile phones and software like Skype, communication and telecommuting has never been the same. And that’s what Voice over Internet Protocol (VoIP) truly is – game-changing telephony that has brought the world closer to our fingertips – and at a much cheaper cost than could’ve ever been imagined. Skype may be immensely popular, but it’s products like the netTalk Duo and magicJack Plus that make VoIP a more interesting landline alternative. Neither of these are entirely new to the market, at least not conceptually. 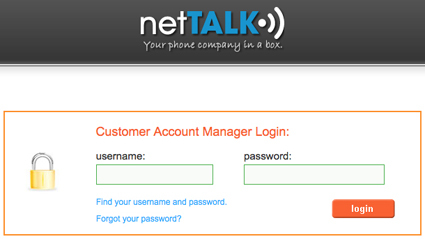 The netTalk Duo already got its start in the U.S., and entered the Canadian market in July, while the original magicJack has been available in Canada for the last two or three years. 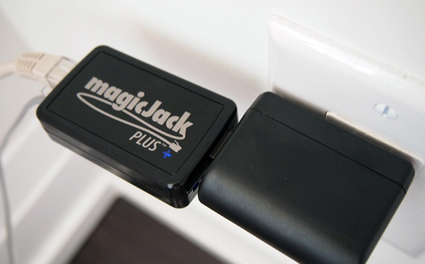 The magicJack plugs into a power outlet and your telephone. Both services offer voice mail, caller ID, call forwarding, call waiting, your own phone number and free calls to anywhere in the U.S. and Canada. Long distance calls to other countries are also at pretty competitive rates compared to other vendors. To make all this work, you must have a broadband connection, so those who are stuck using dialup or satellite service for rural communities won’t be able to make use of either product because a minimum 128kbps upload rate is required. Each dongle has an Ethernet port, a phone jack and a USB port or plug. These two differ in that the netTalk Duo has a mini-USB port that its power adapter plugs into, while the magicJack Plus has a regular USB plug that pops out, which can either be plugged into a USB extension cable or directly into the power adapter. In a home office, where the router may be on, or very close to a desk, plugging either dongle directly into the router makes things convenient, but both also work with HomePlug adapters that route an Internet connection through power outlets. This adds to the convenience of being able to have the router in a totally separate room of a home or small office. With all the pieces in place and connected, you should hear a dial-tone within 20 seconds. And while you can make calls, you do need to set up your account with netTalk or magicJack to get your phone number and 911 service registered, so that your 12 months of service kicks in. Mind you, magicJack limits you to just 30 minutes of talk time before registering anyway, or within 48 hours of initially plugging the device into your home network. Installation steps are pretty straightforward for both units, though it was unfortunate that the netTalk Duo driver could only be installed on a Windows PC for setup, despite the fact I was able to set up my account and phone number using Firefox on a Mac. You can opt to use the Duo with a computer but once you hear that first ring after installing the driver, the computer is no longer needed. Plug it into your router and you’re good to go. There are some instructions on setting up voice mail and call forwarding, including voice mail to email service. The Duo offers free 411 service and three-way calling can be initiated by pressing *46# during a call with another caller waiting. You’ll need a Web browser to set up your phone account. The magicJack Plus has a slightly easier setup process, generally speaking. The Plus can be set up by plugging the dongle into either a PC or Mac, or by just plugging it into a router directly. Registration is pretty much the same, except there are no drivers to install, so the software is already loaded onto the dongle. After about three minutes, you should encounter a screen where you can choose what kind of phone number you want. 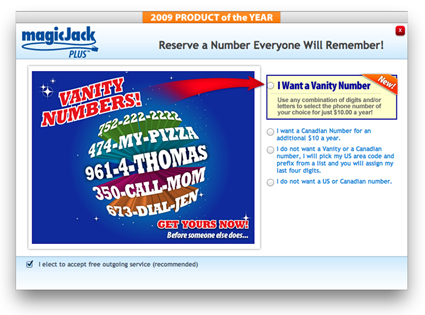 Unlike netTalk, which doesn’t offer much variation in this regard, magicJack Plus gives you the option of trying for a vanity number, a Canadian number or a U.S. number. The jurisdictions don’t matter, so if you had a bunch of clients in, say, New York, but you’re based in Toronto or Vancouver, you could easily pick a New York number that they could call locally. Unfortunately, vanity numbers seem to only be available for American numbers. Canadian provinces are on the pull-down menu, but it doesn’t seem like any are available with Canuck area codes, though this could change over time. Want your number to be 1-800-AWESOME? 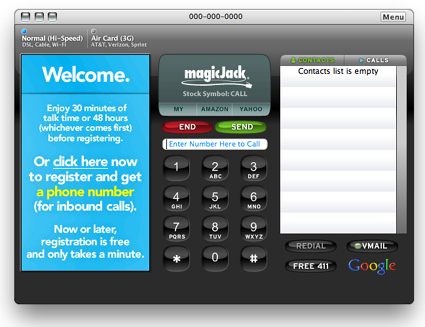 magicJack offers vanity numbers. The beauty of both these products is that they can be used when traveling, too. The netTalk Duo may only work with a PC when plugged in directly, while the magicJack Plus works with a Mac as well, but that doesn’t matter as much if you’re in a hotel room with an Ethernet port ready for you. Bonus if the room’s phone is on the same desk because there is nothing stopping you from pulling off the same setup in there. The only downside would be that you would have to plug the hotel’s phone line back in anytime you needed something from the staff. But in almost any travelling situation where the Internet and a phone line are accessible, either product should work just fine. Failing the use of a phone, just using a computer is good enough. The Plus has a soft phone application built-in where it just uses the power and Internet connection of the laptop to make or take calls. The netTalk Duo performs the same way, and even includes a video chatting element, but again, this only applies to PCs and not Macs. Using a headset is also supported for greater privacy where necessary. Dial using your computer via the softphone option. Call quality is the one element that may surprise you the most because of the consistent clarity. Clearly, improvements were made here, as the echoing and other issues that tend to plague VoIP calls just didn’t play much of a role in my tests. In fact, people I spoke to had no idea I was even calling from a VoIP line. And the costs are hard to beat. 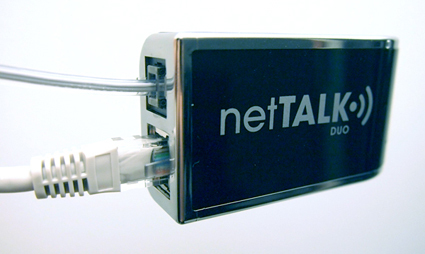 The netTalk Duo is an upfront cost of $79.99 that includes both the device and 12 months of service. Each additional year is a flat fee of $39.99. The magicJack Plus is $49.99 upfront with 12 months of service, and $19.95 for each year thereafter, plus an extra $10 for a Canadian number. The Plus has been delayed, but is expected to launch in Canada very soon. Considering what a landline costs, even by today’s standards, the savings over a full year for a consumer or small business are definitely compelling. But is there enough here to replace a small business owner’s cell phone plan, which may offer all the airtime he or she needs? It really depends on the situation, but even as an office complement or a way for parents to provide their kids with their own phone line, there may be a hole either of these devices can fill.